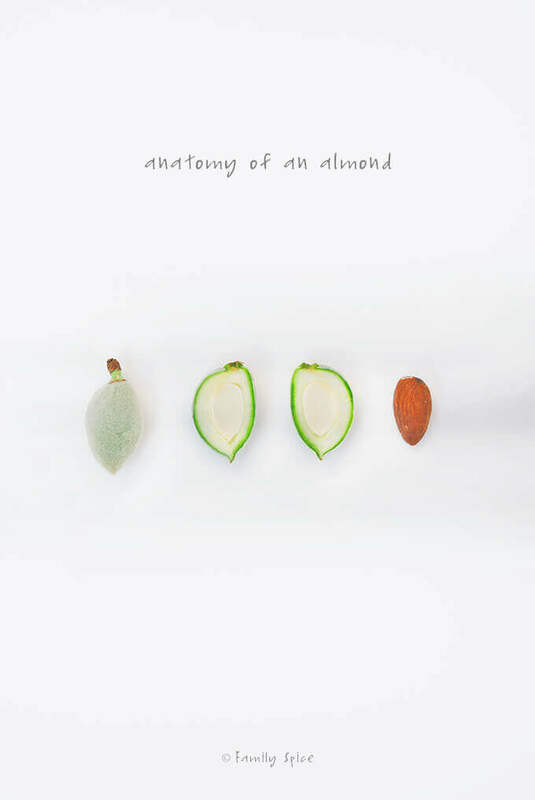 Home » All About... » The Amazing Almond… In The Raw! The entire pod of the green almond is not only edible, but it is also delicious. The center almond is still soft and tastes a little sour. It’s a favorite snack amongst Persians. Most Middle-Eastern cultures are nuts for nuts: pistachios, walnuts, almonds, hazlenut… We just can’t get enough of them. We bake with them, we add them to stews, and eat them straight up. Iranians in particular, are nuts for almonds, specifically, the green almond. This is almond fruit at its youth. And it tastes completely different than the almonds you normally eat. Almonds are super healthy. They are high in protein, high in fiber and low in fat. They are a rich source of Vitamin E and are also rich in monounsaturated fat – one of the “good” fats that lower your cholesterol. It is the nut of choice for those on a diet and who lead a healthy eating-lifestyle. Due to it’s soft texture and mild flavor, almonds can be processed into almond milk, offering those with lactose intolerance with a non-soy milk alternative. Spicie Foodie has done a wonderful post on how you can make your own almond milk here. 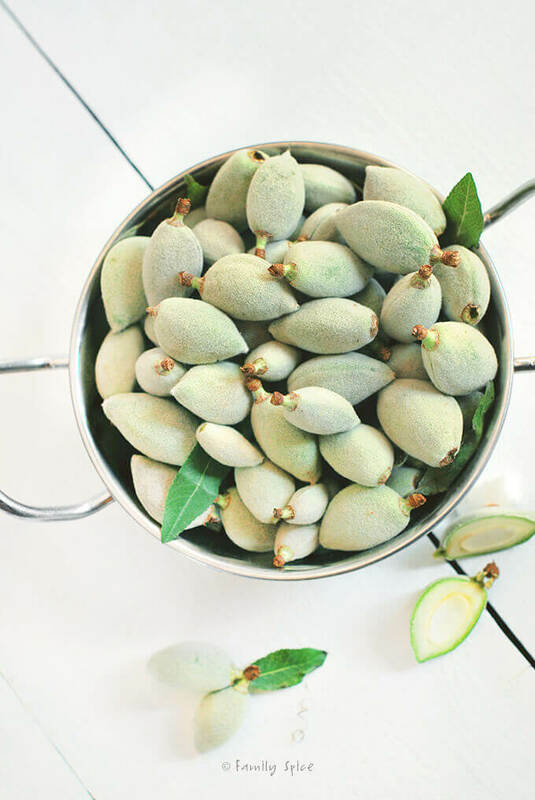 Almonds can also be ground into almond meal, or almond flour, and can be used for baked goods, offering celiacs and diabetics a low-carb gluten-free, high fiber, protein rich dessert. 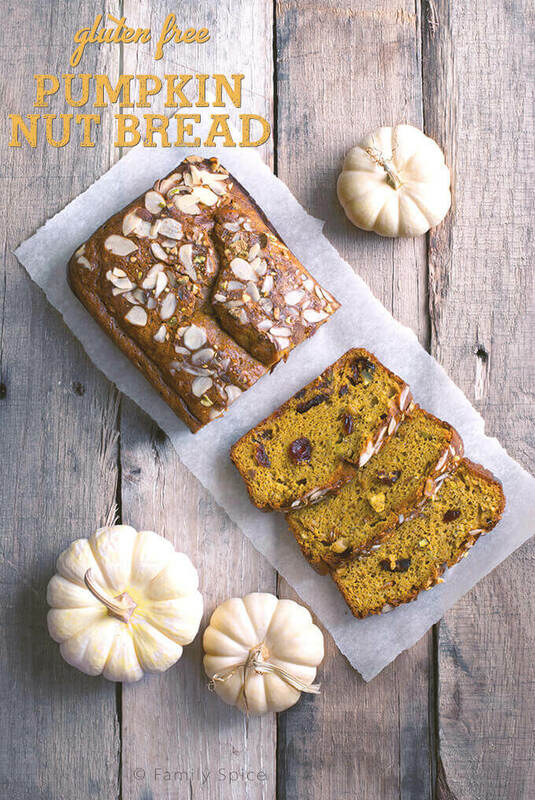 Many food bloggers have found the benefits and joys of baking with almond flour and have developed many creative gluten-free dessert recipes, such as cupcakes, cookies and brownies. Almond Butter offers a great alternative to its saltier cousin, Peanut Butter, and can also be used for baking. It’s very easy to make your own homemade nut butter. I’ve got the step-by-step instructions here. In Iran, we like to eat the young almond fruit whole. These are the “green almonds,” named because of the soft green skin on the outside. 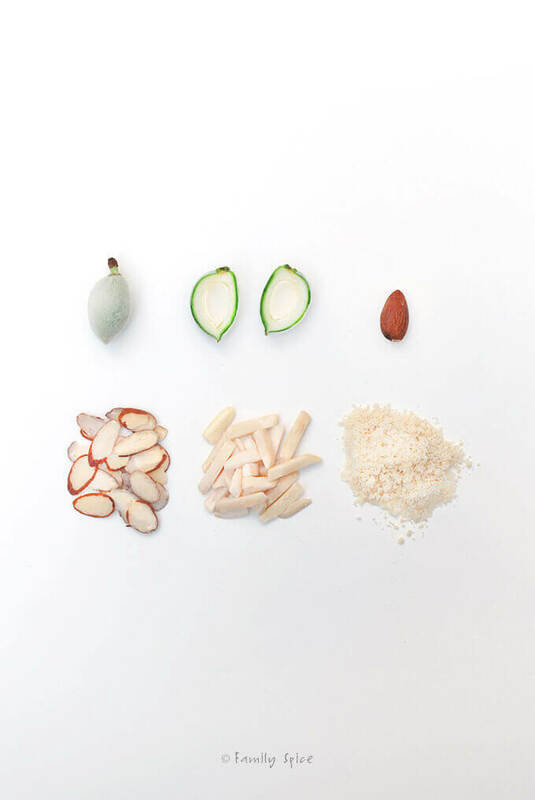 The inner shell has not hardened yet and the young almond has a tangy, sour flavor. The most popular way of eating these baby almonds (as my kids like to call them) is sprinkled with salt. The salt cuts down the sour taste. Chaqaleh Badoon, these salty treats, are typically sold as snacks on the street markets in Iran. In, the U.S., we raid our Middle-Eastern markets from April through May looking for these tangy treats. 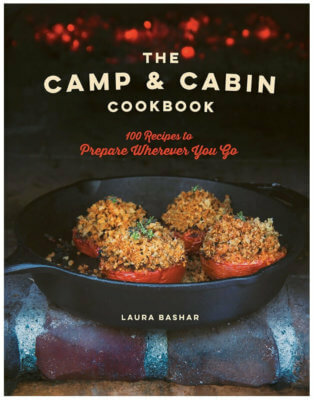 So, if you have a Middle-Eastern market near you and you are ready for another culinary adventure, you have got to try out these bites of joy. Healthier than potato chips, but equally addicting, especially for those with salty and sour taste buds. 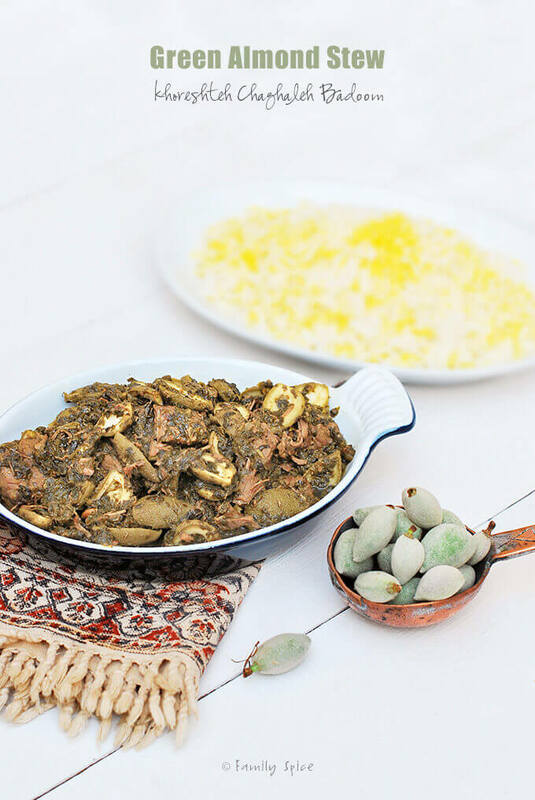 If you are a fan of Persian stews, then have to try this Green Almond Stew (Khorest-eh Chagaleh Badam). Made with either lamb or beef, and fresh mint, parsley and these beautiful green almonds. I think you will be pleasantly surprised with what you taste. I have tried green almonds and loved it! In Brussels you see them in all those middle-eastern shops. I never knew what I could do with them, so I never bought them. But that will change! I've never seen a green almond! Tried it once & now love the flavour! I eat it with salt & hot red chilly powder. Your article informed me that the almond is cooler than I thought. Now onto my quest of finding green almonds at the market. Cheers! I found them in San Francisco’s Clement Street Chinatown. They were $1.99 per pound. The almonds were bagged in one pound nylon net bag so you can’t taste one first. Since I love almonds so I was willing to take a chance on this new treat and I’m glad I did.